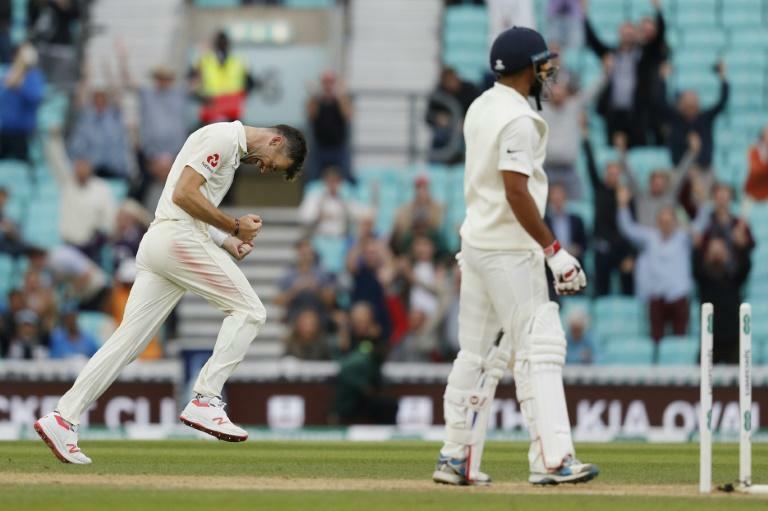 With just one wicket to fall, and Anderson needing one more to break the record of 563 he had shared with retired Australia great Glenn McGrath, the 36-year-old Lancashire paceman bowled Mohammed Shami to give England victory in the fifth Test and a 4-1 series win. India were dismissed for 345 on the fifth and final day, having been set a mammoth 464 for victory. They collapsed to two for three before a sixth-wicket stand of 204 between opener KL Rahul (149) and wicket-keeper Rishabh Pant (114) gave them hope of an improbable win. But leg-spinner Adil Rashid took two for three in 12 balls to remove both century-makers after tea, with India then struggling at 328 for seven. England declared their second innings at 423 for eight on Monday. Alastair Cook made 147 in his final Test innings before international retirement and England captain Joe Root hit 125, with the pair putting on 259 for the third wicket. Cook's innings meant he became just the fifth player in history, after Australia's Reggie Duff, Bill Ponsford and Greg Chappell and India's Mohammad Azharuddin to score hundreds in both their first and last Tests.